18.03.19 05:14 Transfer Sent Payment: 150.00 USD to account U18187794 from U1294xxx. Batch: 251369029. Memo: Shopping Cart Payment. 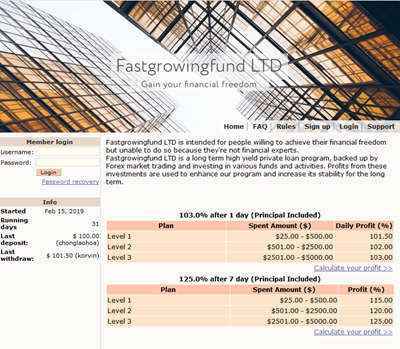 Deposit to Fastgrowingfund LTD User allhyips. 21.03.19 04:34;Account;Receive;Received Payment 2.25 USD from account U18187794 to account U1294000. Batch: 251896838. Memo: API Payment. Withdraw to allhyips from Fastgrowingfund LTD.
20.03.19 08:36;Account;Receive;Received Payment 2.25 USD from account U18187794 to account U1294000. Batch: 251757792. Memo: API Payment. Withdraw to allhyips from Fastgrowingfund LTD.
23.03.19 06:37;Account;Receive;Received Payment 2.25 USD from account U18187794 to account U1294000. Batch: 252242673. Memo: API Payment. Withdraw to allhyips from Fastgrowingfund LTD.
22.03.19 08:15;Account;Receive;Received Payment 2.25 USD from account U18187794 to account U1294000. Batch: 252092835. Memo: API Payment. Withdraw to allhyips from Fastgrowingfund LTD.
24.03.19 06:19;Account;Receive;Received Payment 2.25 USD from account U18187794 to account U1294000. Batch: 252370736. Memo: API Payment. Withdraw to allhyips from Fastgrowingfund LTD.
26.03.19 01:59;Account;Receive;Received Payment 2.25 USD from account U18187794 to account U1294000. Batch: 252629276. Memo: API Payment. Withdraw to allhyips from Fastgrowingfund LTD.
28.03.19 06:59;Account;Receive;Received Payment 2.25 USD from account U18187794 to account U1294000. Batch: 252949678. Memo: API Payment. Withdraw to allhyips from Fastgrowingfund LTD.
30.03.19 02:10;Account;Receive;Received Payment 2.25 USD from account U18187794 to account U1294000. Batch: 253202402. Memo: API Payment. Withdraw to allhyips from Fastgrowingfund LTD.
29.03.19 04:14;Account;Receive;Received Payment 2.25 USD from account U18187794 to account U1294000. Batch: 253077664. Memo: API Payment. Withdraw to allhyips from Fastgrowingfund LTD.
31.03.19 03:25;Account;Receive;Received Payment 2.25 USD from account U18187794 to account U1294000. Batch: 253310356. Memo: API Payment. Withdraw to allhyips from Fastgrowingfund LTD.
01.04.19 12:30;Account;Receive;Received Payment 2.25 USD from account U18187794 to account U1294000. Batch: 253500097. Memo: API Payment. Withdraw to allhyips from Fastgrowingfund. 02.04.19 07:03;Account;Receive;Received Payment 2.25 USD from account U18187794 to account U1294000. Batch: 253940740. Memo: API Payment. Withdraw to allhyips from Fastgrowingfund.